Talavera Split Ender PRO with its New Surgy-Trim System technology is a revolutionary invention for professional stylists. It is specially designed to trim the ends of the hair where damaged hair ends and split ends start while preserving the beautiful, long, healthy hair, ensuring that all the ends (split, damaged or dry) are trimmed and healthy. It snips the ends, not the Length. 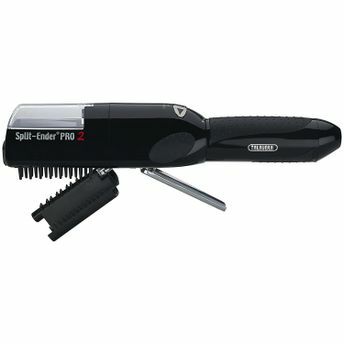 The Split-Ender's unique patented hair plate is specially designed to guide the hair strands to uniformly flow in and out throughout the strand guards. Each hair is safely guided in a straight motion, forcing each one to stand straight up when reaching the centre of the hair plate. This system only delivers the ends into the blades to snip the tip by approximately 1/8"""" to 1/4"""" (depending on the trim setting you select) trimming the parts where burned, dry, damaged hair ends and split ends are more likely to be found. All this - while preserving and leaving the long, beautiful and healthy hair strands untouched.